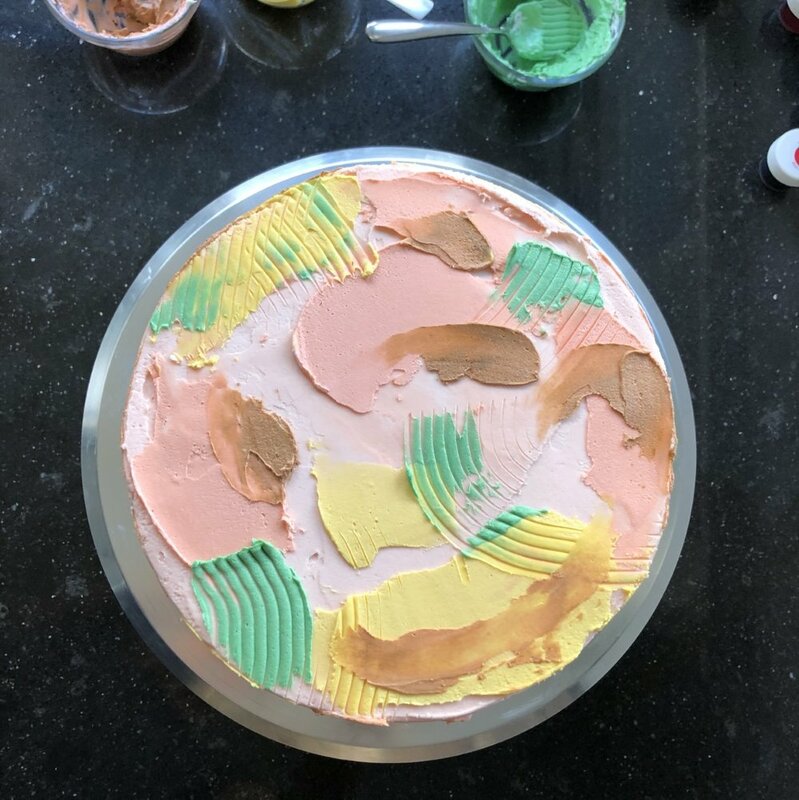 First, start with a chilled cake with your base color applied. I left my base frosting roughly textured, but if you prefer smooth that would totally work too. Then, I used Wilton Gel Icing Colors to create my colors that I used for decorating. The colors are powerful! Start with a tiny bit, and add more as needed. To have the best texture for this technique, it’s important to use gel colors. They do not dilute your frosting as much as a more watery coloring agent. 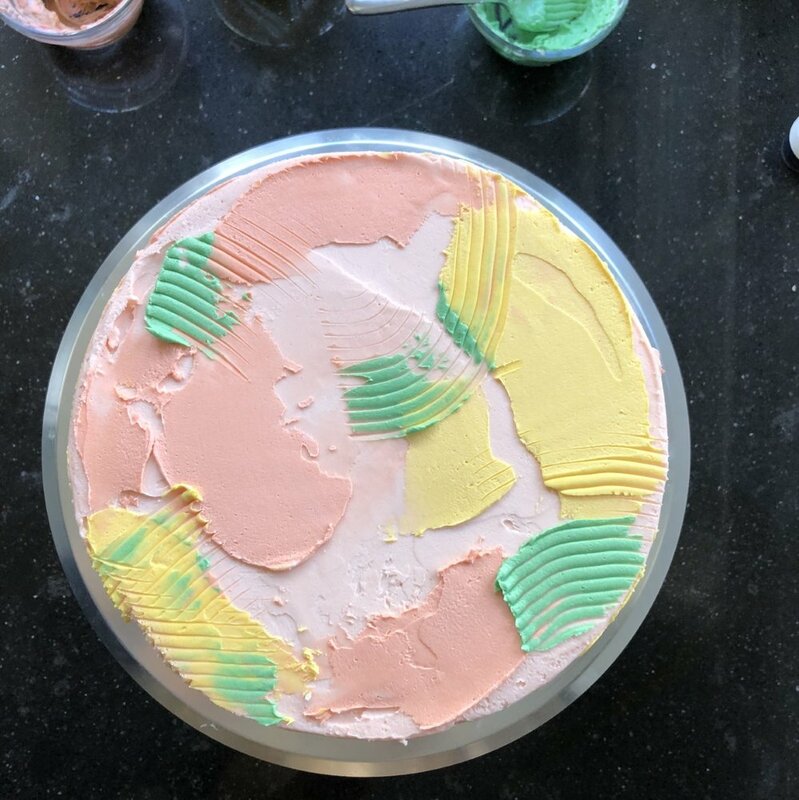 Once you’ve added all of your color, if the buttercream is thick, add enough milk or cream so that it will spread like room temperature butter. Start with just a little bit of frosting on your off-set spatula. You don’t need much, and it’s better to start with less than you need and to gradually add more. Add swipes here and there with one color. This is the fun part! Don’t worry too much about doing it the “right” way. Follow your intuition! This style of cake is an expression, so let yourself go! Chill the cake for a few minutes before applying your next color. 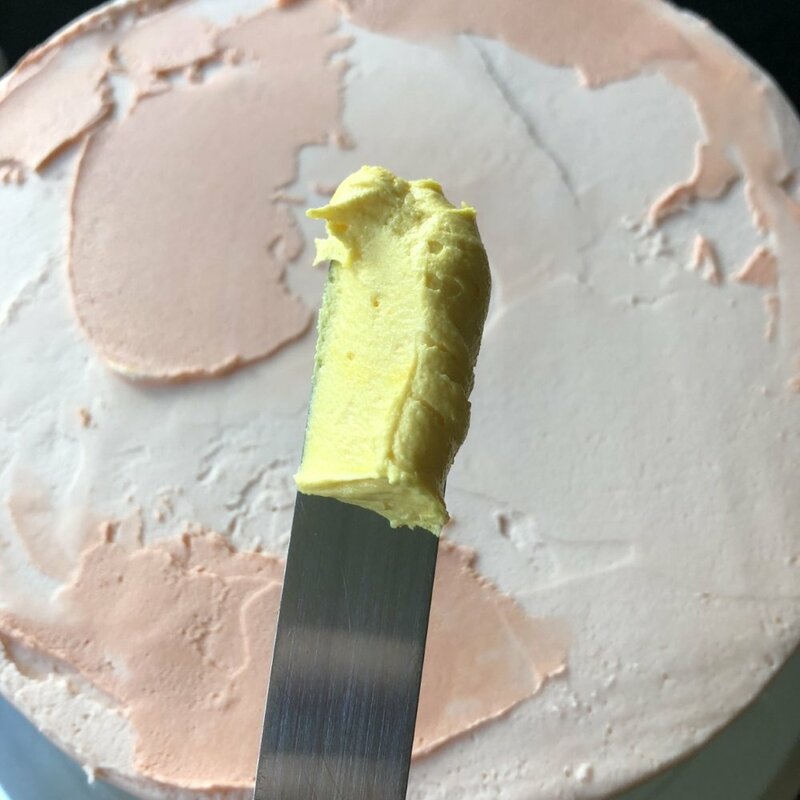 If you allow the frosting to firm up a bit, you will have less color mixing in your final design. 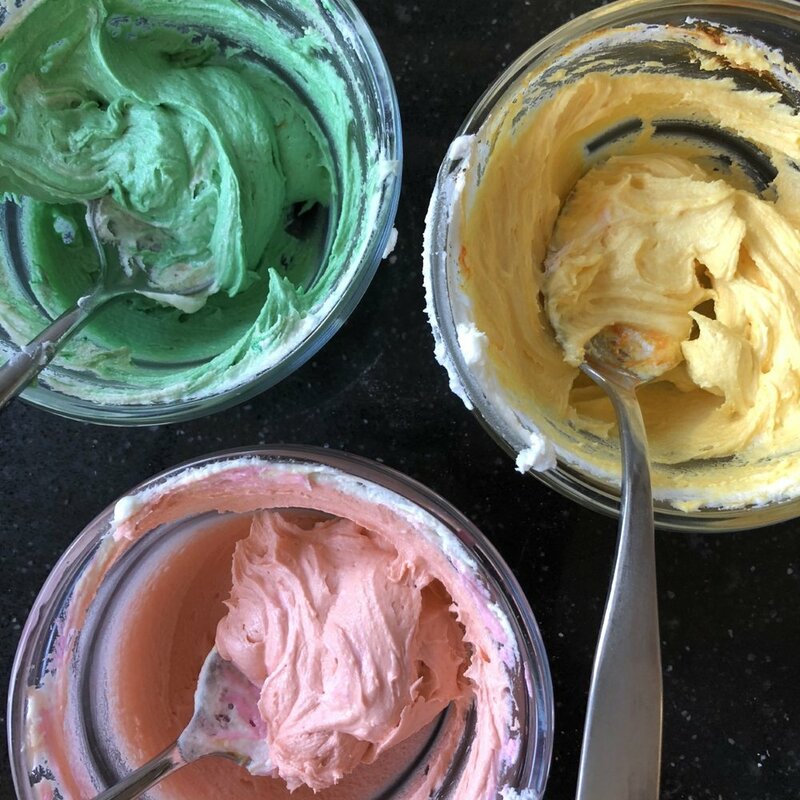 If you want to add some additional texture, you can switch to a frosting comb for a color or two. Keep adding colors one by one until you have added as much as you would like. There’s no right amount. You could be done at this point, but for this cake I added a border. The contrast between such a traditional, structured technique like piping and the free-form, modern painting style is a playful pairing I enjoy a lot. If you decide to add a border, chill the cake while you mix your border color. I like to make the border a little darker than the other colors. It helps to bring some structure to your design. I used a Wilton 1M piping tip. This is my go-to tip for a classic shell border. If you want to add sprinkles, add them quickly before the frosting sets. I used Wilton Autumn Sugar Sprinkles to play up the autumn mood. *When applying the color, I don’t like to give too many rules because you will find your own groove, and I don’t want to get in the way of your discoveries. However, if you need a somewhere to start, think about balance (size and color) and rhythm when applying the colors. *If you really want a fun way to get your creative juices flowing, choose a work of art (painting, book cover, Instagram photo) and squint your eyes. Create the colors that you see in your frostings. Try to mimic the blurred shapes you see on your cake. Don’t worry about exactness, it’s a new work that is “inspired by” this work you love. *When you have the time/energy/desire, think about color and flavor pairings. For this cake, I made a vanilla cake spiced with cloves and ginger. For the filling I used apple butter. Super yum! This is a great design for anytime you have some creative energy to set free! Have fun! For other cake designs and fall baking ideas, please see Wilton Autumn Ideas Page. Thank you to Wilton for sponsoring this post! 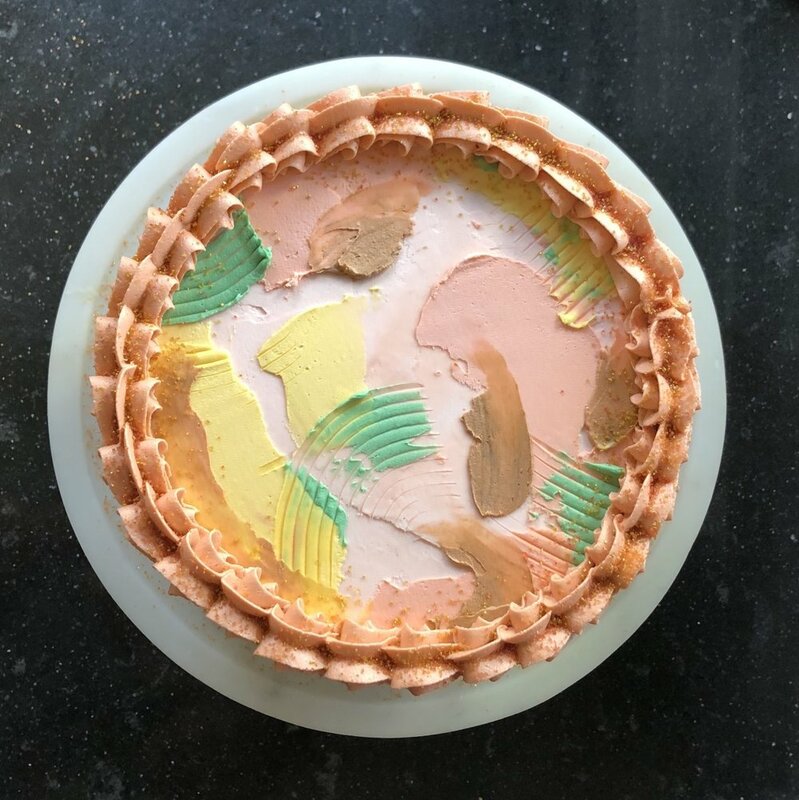 I had so much fun creating this cake with the decorating products gifted to me! Anything that I have said about Wilton and its products is accurate and reflects my honest opinion and experience.